Clean modern lines and a no-fuss casual design make the Stirling Park Leather Chair a handsome expression of keen style sensibilities. 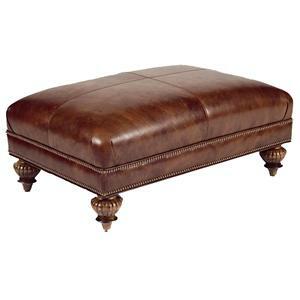 This leather-upholstered chair offers a tight cushion back and ultra down cushion seat for you to comfortably settle into while conversing with friends and family. The sleek track arms are gently rounded at the top and terminate in square, tapered exposed wood feet. A row of rustic bronze nailhead trim defines the profile of the Stirling Park Leather Chair, beautifully bordering the leather of your choosing. With a wide assortment of leather colors and textures to choose from, you can custom order this chair to perfectly coordinate with your specific décor. 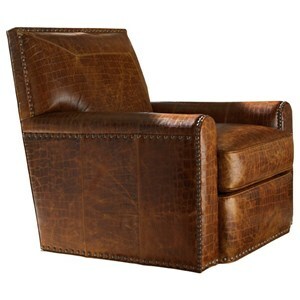 Create a relaxing environment with a contemporary edge and welcome the Stirling Park Leather Chair into your home. 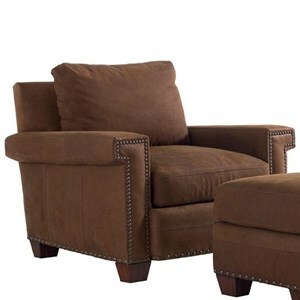 This chair is also available with a swivel base. The Tommy Bahama Upholstery Stirling Park Leather-Upholstered Tight Back Chair with Track Arms & Decorative Nailhead Trim by Tommy Bahama Home at Hudson's Furniture in the Tampa, St Petersburg, Orlando, Ormond Beach & Sarasota Florida area. Product availability may vary. Contact us for the most current availability on this product. Fabric Options Assorted leather and fabric covers to choose from. Seat Support A network of eight-way hand-tied tempered steel coils provides a base of long-lasting support; a perimeter ring of heavier gauge coils adds durability. Stylish yet timeless, the pieces in the Tommy Bahama Upholstery collection are designed to complement the exceptional craftsmanship, beautiful finishes and luxurious coverings of the original Tommy Bahama collections. An assortment of upholstered accents comprise this versatile collection, and are offered in an array of rich leathers, playful patterns and understated solids that beautifully reflect your decorative tastes. Peruse the Tommy Bahama upholstery collection to find the perfect upholstered accent for you. The Tommy Bahama Upholstery collection is a great option if you are looking for Casual furniture in the Tampa, St Petersburg, Orlando, Ormond Beach & Sarasota Florida area. Browse other items in the Tommy Bahama Upholstery collection from Hudson's Furniture in the Tampa, St Petersburg, Orlando, Ormond Beach & Sarasota Florida area.